Some time back in 2009, ButterflyCircle members encountered a new species, then unrecorded in the Malaysian Butterfly Checklist, on Pulau Langkawi in Malaysia. 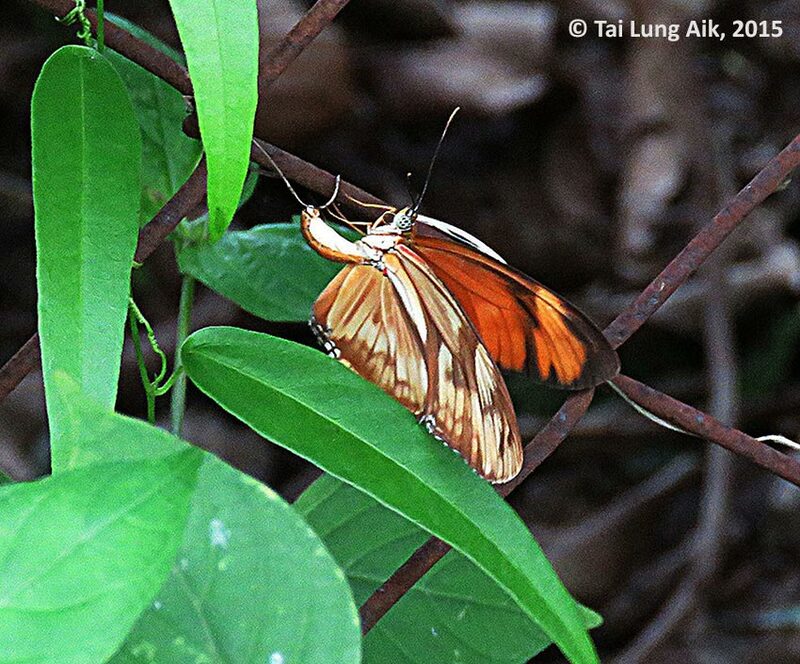 We were surprised to encounter the Dryas iulia, known by its English common name of Julia Heliconian, in Malaysia. 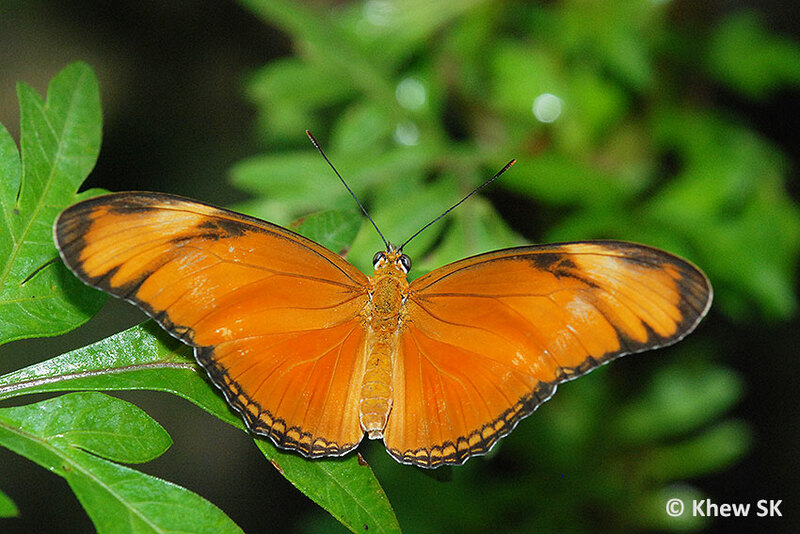 This neotropical butterfly originates from the southern states of USA to the South American countries like Mexico, Costa Rica, Ecuador, Brazil, Peru and Bolivia. 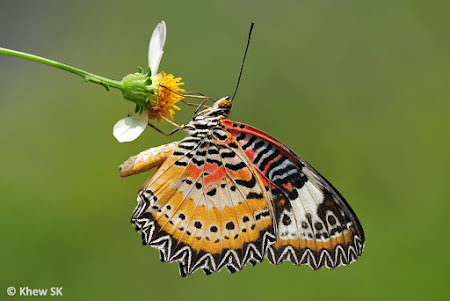 In my earlier article on the discovery of the Julia Heliconian, I postulated that the spread of this species would likely follow the colonisation route of two other species previously not found in Malaysia and Singapore, The Leopard Lacewing (Cethosia cyane) and Tawny Coster (Acreae terpsicore). Both these species have now fully extended their range southwards and are now resident species in Singapore, and in the case of the Tawny Coster, even further southwards to Indonesia. 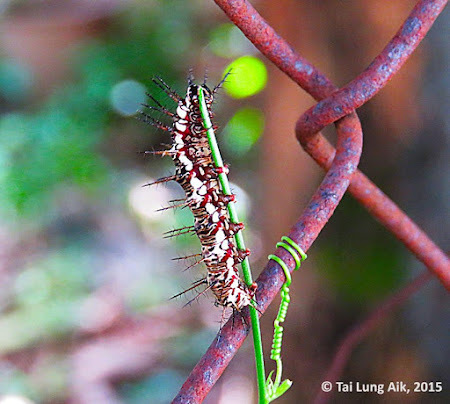 Leopard Lacewing and Tawny Coster, two "exotics" that have colonised Malaysia and Singapore habitats and are now considered widespread. Just two decades ago, these species were not found in either country. 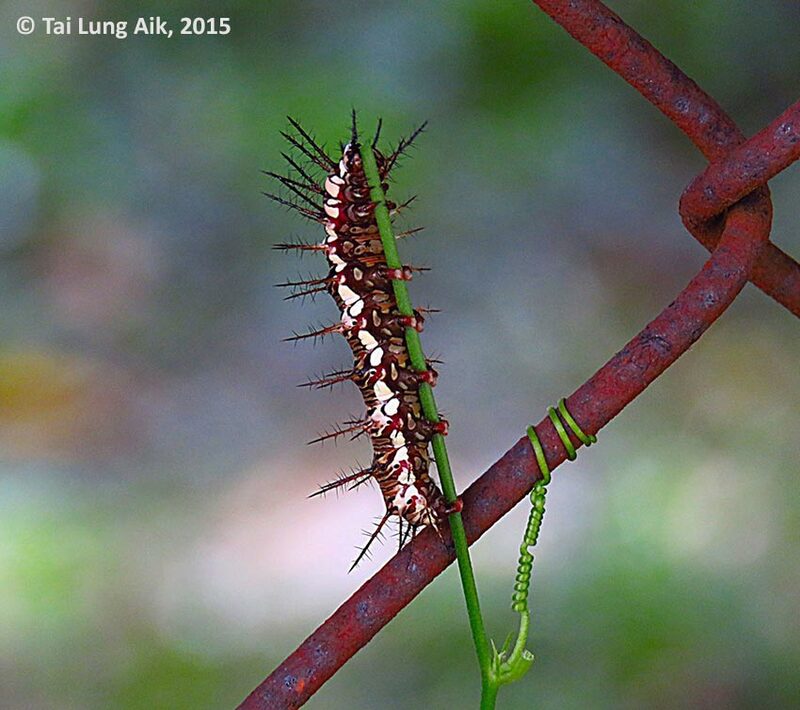 Just about six years after the first sighting of this species on Pulau Langkawi, a recent sighting by butterfly enthusiast Tai Lung Aik in Subang Jaya in the state of Selangor in Malaysia, supports the view that the Julia Longwing will continue to extend its range southwards in Peninsula Malaysia. 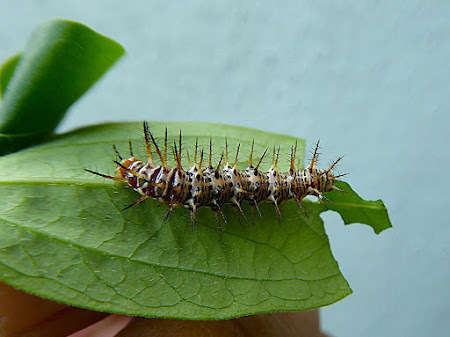 Several sightings of an ovipositing female Julia Heliconian and the discovery of mature caterpillars on the host plant Passiflora suberosa, strongly suggests that the butterfly is moving slowly, but surely, down south and colonising areas conducive to its survival. It would appear that the Julia Heliconian has now adapted to two non-native, but widespread host plants, Passiflora foetida and Passiflora suberosa. Both plants are invasives and grow easily in the wild. 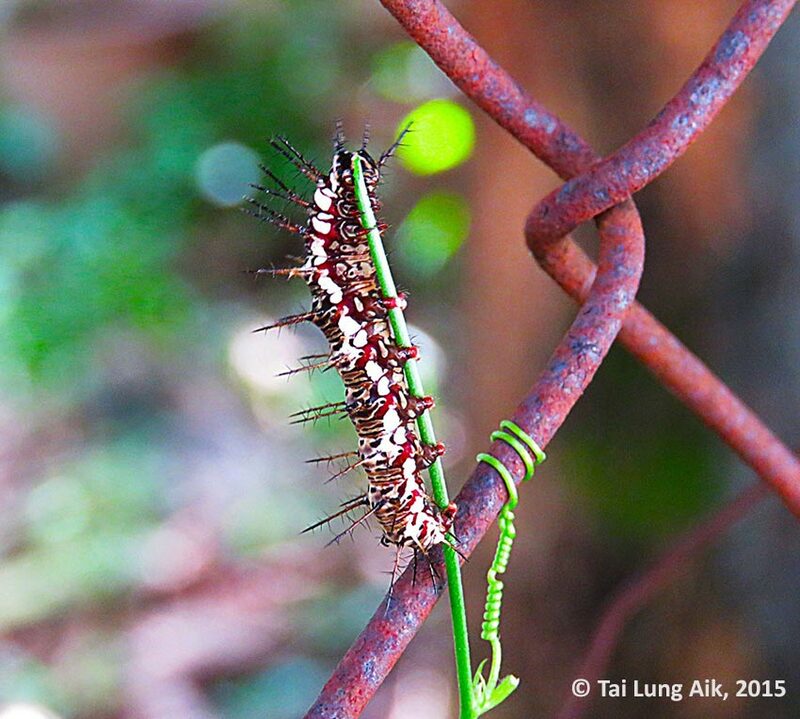 In the case of the adult butterfly and caterpillars found by Lung Aik, they were discovered on an urban roadside fence on which the host plant was growing wild. This is not a cultivated plant nor a species that is popular for its aesthetic appeal to gardening enthusiasts. 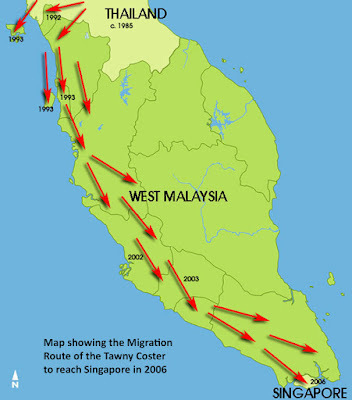 The migration route of the Tawny Coster. 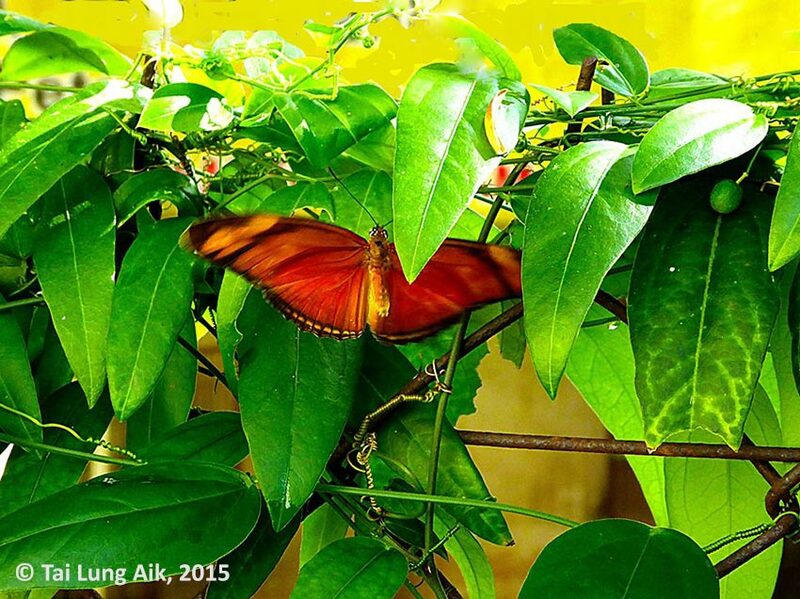 Will the Julia Heliconian be found in Singapore soon? 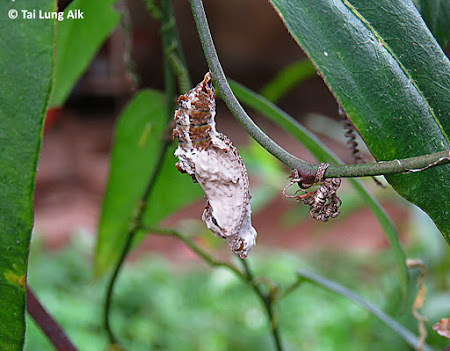 If we trace the journey of the Tawny Coster that was previously absent from the Malaysia/Singapore butterfly fauna, it took nine years after it was first spotted in Pulau Langkawi to reach Petaling Jaya in the state of Selangor. 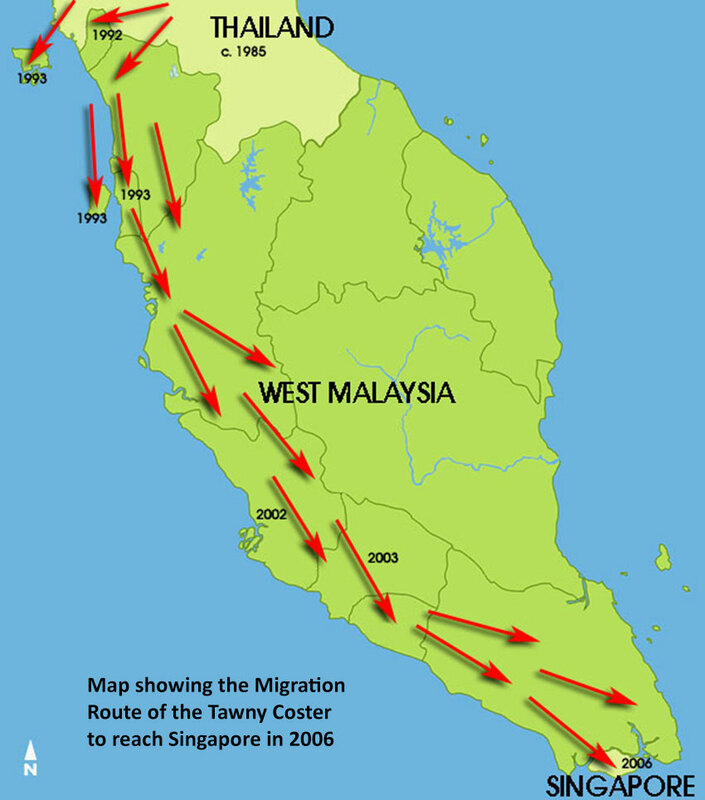 Thereafter, it continued its colonisation southwards and reached Singapore in about four years. 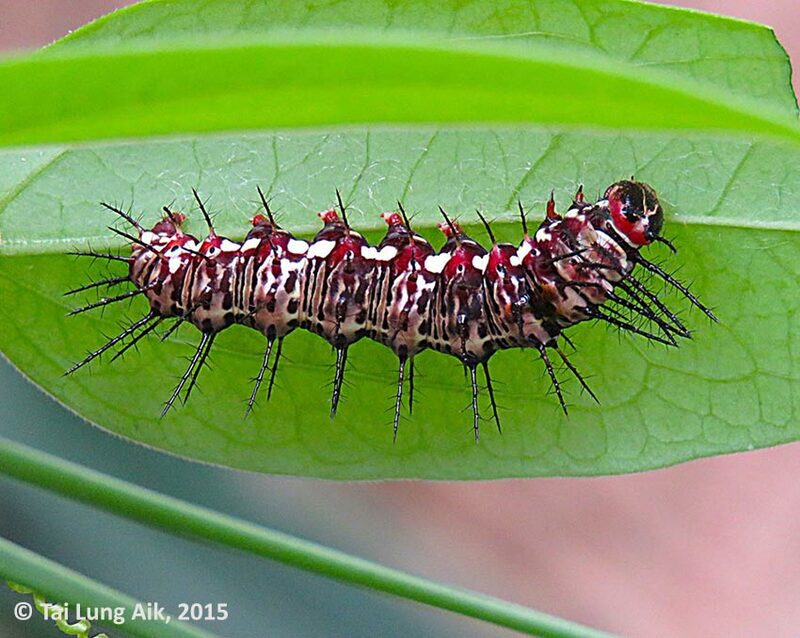 Given that the Julia Heliconian is an even stronger flyer and shares the same caterpillar host plants as the Tawny Coster, will be see it in Singapore even faster? Perhaps in the next two to three years? Keep your eyes peeled for this South American invader! A scientific paper has been written about the Julia Heliconian by Noah Burg et al. The paper implies that the Julia Heliconian, now found in Southeast Asia, probably originated from a butterfly farm in Phuket. 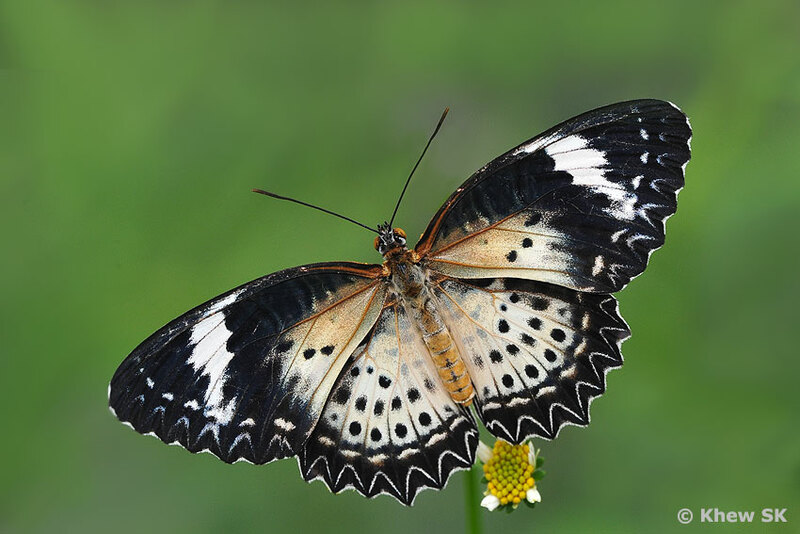 The practice of releasing butterflies at weddings and also as a religious gesture during Vesak Day (a Buddhist festival), probably aided the spread of this exotic species. 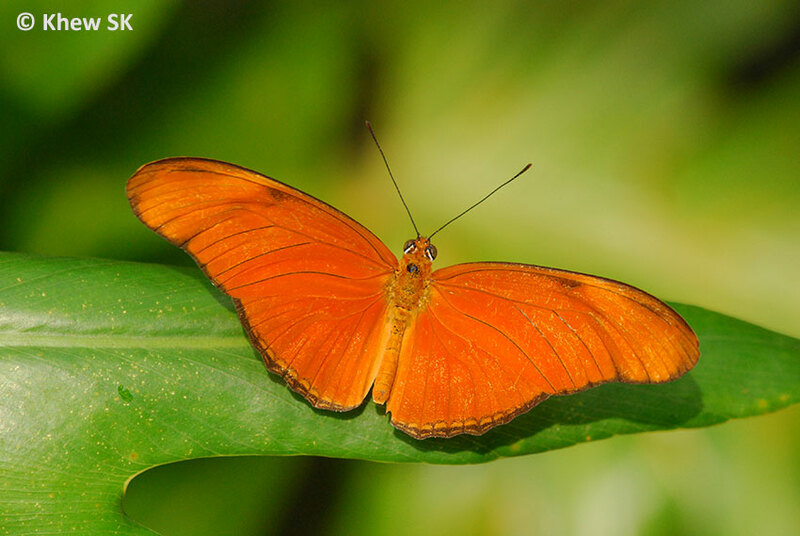 The paper also continued to validate its thesis using DNA sequencing, and proved that the Julia Heliconian found in Thailand and Malaysia, had its origins from Costa Rica. 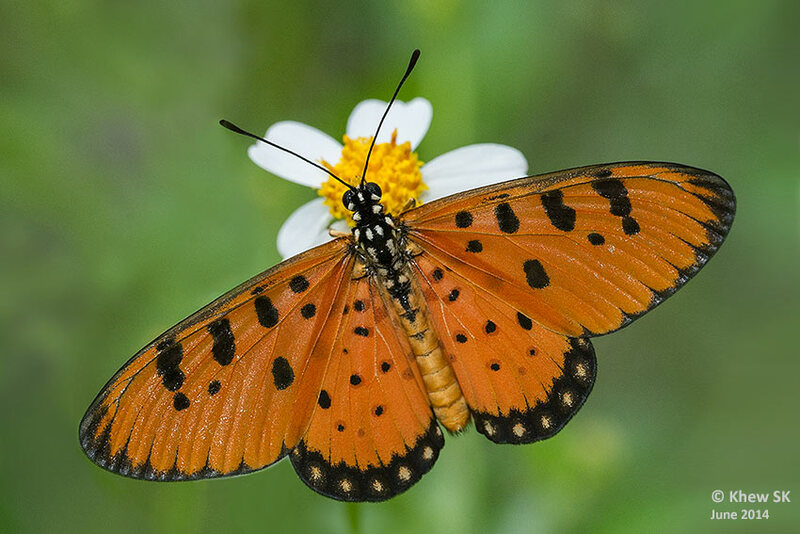 The DNA codes correspond with the subspecies Dryas iulia modesta which had likely made its way via human agency, having been imported as an exotic species to be featured at a butterfly farm in Phuket, Thailand. 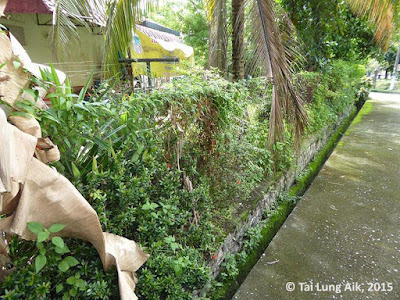 There are some observers who consider the "invasion" of this exotic species a serious "feral species invasion" in Southeast Asia, and anyone who spots this species should destroy it to prevent its impact on the native species in Southeast Asia. This may be an ideal or optimistic view, but certainly a futile one. 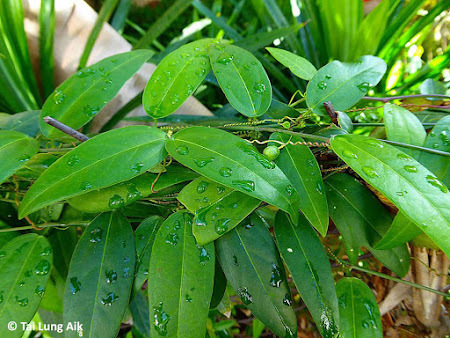 The scientific paper by Noah Burg et al mentioned, "The distribution of the species in Thailand currently encompasses thousands of square kilometers, and eradication efforts are unlikely to be successful, particularly since P. foetida (and now P. suberosa as well) is a common, invasive species, making it difficult to find all possible larval host plants for control purposes." I concur with the authors' views on the futility of any efforts to eradicate these species. Further premeditated interventions may even unknowingly cause the inadvertent demise of other species! The authors of the paper also mentioned "It is unclear how this novel introduction will affect wild populations of other organisms. The species has been observed feeding on Passiflora foetida, which is an invasive plant in Thailand, and the butterfly might therefore be a boon for biological control of this weed." 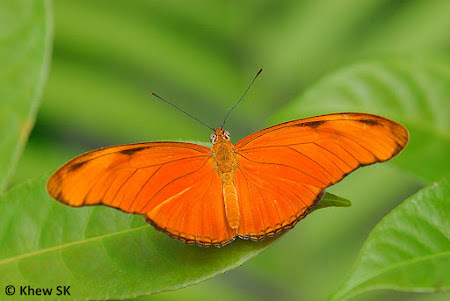 It would be interesting to see how the Julia Heliconian, an exotic, competes for survival against two other species, themselves exotics and "alien" to Southeast Asia until the end of the last millennium. As the Julia Heliconian, Tawny Coster and Leopard Lacewing all share the same host plants, it may be a case of "aliens vs aliens" in a battle for supremacy! The two host plants themselves are "aliens" and considered weeds. So it will be an interesting ecological study for academics who may wish to pursue this topic of invasive flora and fauna battling amongst themselves to establish control over a newly colonised habitat. It may have started with a mistake of allowing imports of butterfly pupae from different parts of the world, but there is little that we can do to eradicate this species now. Butterfly releases further aggravate the problem, as they are intentionally spread by humans into their new environment. 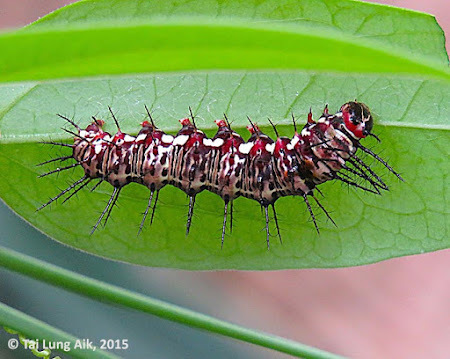 Southeast Asian butterfly farms also export butterfly pupae to butterfly houses and farms in temperate countries. Fortunately, biological legislation and biohazard regulations help to control such "exotics" (from the point of Europe and US), from escaping and establishing new alien populations. The question that we should ask now is, what other species are butterfly farms in the region importing from South America (and elsewhere) and would the release of these species continue unabated without any controls? The authors of the paper also alluded to genetic biopollution and other pathological risks, even if species amongst countries within the region cross borders via human agency. 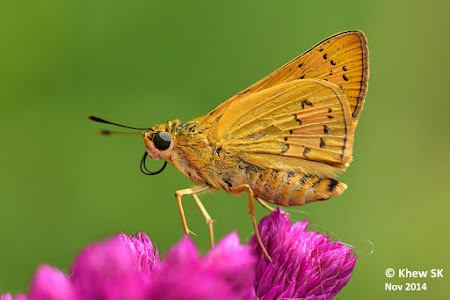 As it is, an Australian species, the Yellow Palm Dart (Cephrenes trichopepla) a skipper that was not known from Southeast Asia, has spread, probably due to horticultural trade, as far as the northern state of Perak in Malaysia. It has quietly and undramatically spread from its country of origin, Australia, and rapidly moved up north, as it resembles many local species and may have gone unnoticed. 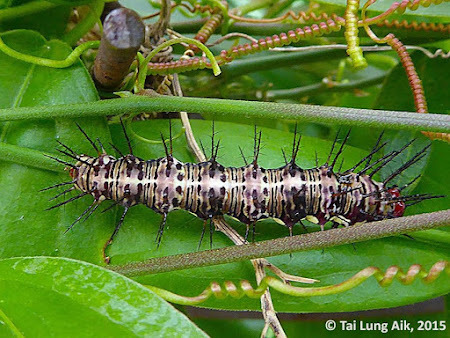 Its caterpillars feed on Palmae, and may be a potential pest to coconut growers. Another male Julia Heliconian shot at the Phuket Butterfly Farm, Thailand. Will we see this species in Singapore soon? 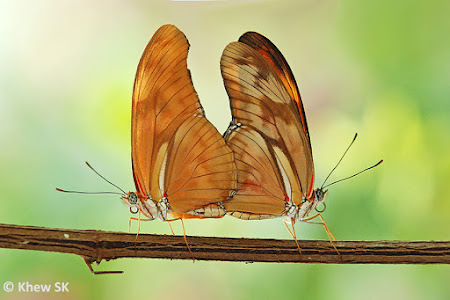 Coming back to our South American beauty, the Julia Heliconian, it is only a matter of time before it further establishes colonies in the southern half of Peninsula Malaysia as it heads down south to Singapore. Keep a look out for a large orange butterfly that flies rather quickly and looks quite different from any of our other extant species in Singapore.